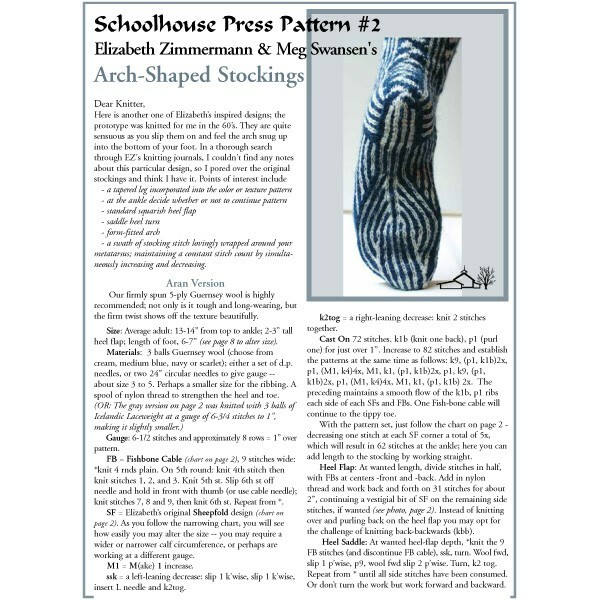 Elizabeth Zimmermann knitted the prototype for the arch shaped stockings in the 1960s. The wonderful shaping makes them quite sensuous as you slip them on and feel the arch snug up into the bottom of your foot. Working just from the prototype, Meg Swansen was able to recreate them and write detailed instructions for a pair of aran and a striking pair of two-color stockings. Also includes charts for alternate patterns such as an elegant Bavarian Twisted Stitch design, and 2 more two-color motifs in Scandinavian and Turkish styles. Instructions, charts, techniques and sizing guidelines.